Garcia-Barreda S, Molina-Grau S, Reyna S (2016). Fertilisation of Quercus seedlings inoculated with Tuber melanosporum: effects on growth and mycorrhization of two host species and two inoculation methods. iForest 10: 267-272. Modern truffle cultivation is based on use of inoculated seedlings, which should exhibit highly colonised roots as well as a vegetative quality enhancing field plant performance. However, poor shoot and fine root growth has been a frequent issue in inoculated Quercus seedlings production. Fertilisation is a common solution in forest nurseries, but high fertilisation levels have been found to inhibit the formation of ectomycorrhizas of many fungal species. The influence of slow-release fertilisation (52 mg N, 26 mg P and 36 mg K per seedling) on growth and ectomycorrhizal status of Tuber melanosporum-inoculated seedlings was evaluated. 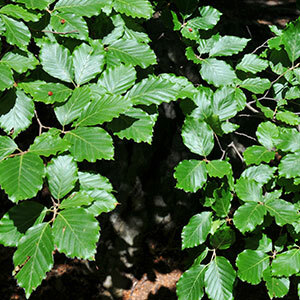 Host species Quercus ilex and Quercus faginea and inoculation methods involving root-dipping and root-powdering were tested. Fertilisation increased weight of both host species without significant detrimental effects on ectomycorrhizal colonisation, showing that it can be effectively used in inoculated seedlings production. Both host species showed similar response to fertilisation. The inoculation method affected seedling weight and ectomycorrhizal status, suggesting that some inoculant carriers are able to damage Quercus development and T. melanosporum colonisation. The study provided an important basis for fine-tuning the use of fertilisers in truffle-inoculated seedling production. Comparative analysis of different methods for evaluating quality of Quercus ilex seedlings inoculated with Tuber melanosporum. Mycorrhiza 24: S29-S37. Effects of nitrogen and phosphorus fertilization on growth and formation of ectomycorrhizae of Quercus alba and Q. rubra seedlings by Pisolithus tinctorius and Scleroderma auranteum. Canadian Journal of Botany 63: 1677-1680. Mycorrhization of Quercus robur L., Quercus cerris L. and Corylus avellana L. seedlings with Tuber macrosporum Vittad. Mycorrhiza 22: 639-646. Effects of the initial level of mycorrhization of young plants inoculated with Tuber melanosporum. In: Abstracts book of “IV International Workshop on Edible Mycorrhizal Mushrooms (IWEMM4)”. Murcia (Spain) 28 Nov - 2 Dec 2005. Universidad de Murcia, Murcia, Spain, pp. 32. Mycorrhizae. In: “The Container Tree Nursery Manual, Vol. 5. The biological component: nursery pests and mycorrhizae” (Landis TD, Tinus RW, McDonald SE, Barnett JP eds). USDA Forest Service, Washington, USA, pp. 101-171. Application pratique de la symbiose ectomycorhizienne: production a grande echelle de plants mycorhizes par la truffe (Tuber melanosporum Vitt.) [Practical application of ectomycorrhizal symbiosis: large-scale production of plants mycorrhized by truffle]. Mushroom Science 10: 483-505. The role of nutrients for improving seedling quality in drylands. New Forests 44: 719-732. Mycorrhization, growth and nutrition of Pinus halepensis seedlings fertilized with different doses and sources of nitrogen. Annals of Forest Science 67: 405. The influence of mycorrhization with Tuber melanosporum in the afforestation of a Mediterranean site with Quercus ilex and Quercus faginea. Forest Ecology and Management 231: 226-233. Methodology for certification of Quercus ilex seedlings inoculated with Tuber melanosporum for commercial application. In: Abstracts booklet of “1st International Conference on Mycorrhizae (ICOM1)” (Szaro TM, Bruns TD eds). Berkeley (California, USA) 4-9 Aug 1996. University of California, Berkeley, California, USA, p 34. Cultivation of Tuber melanosporum in firebreaks: short-term persistence of the fungus and effect of seedling age and soil treatment. Fungal Biology 117: 783-790. Taming the truffle. Timber Press, Portland, USA, pp. 304. Effect of fertilization on growth and ectomycorrhizal development of container-grown and bare-root nursery conifer seedlings. New Forests 22: 179-197. Forty years of inoculating seedlings with truffle fungi: past and future perspectives. Mycorrhiza 25: 77-81. Direct sowing of holm oak acorns: effects of acorn size and soil treatment. Annals of Forest Science 63: 961-967. Management of nursery practices for efficient ectomycorrhizal fungi application in the production of Quercus ilex. Symbiosis 52: 125-131. Viveros y producción de planta micorrizada [Nurseries and production of mycorrhizal plants]. In: “Truficultura: Fundamentos y técnicas” [Trufficulture: Principles and Techniques] (Reyna S ed). Ed. Mundi-Prensa, Madrid, Spain, pp. 209-236. Colonization of Pedunculate oak by the Burgundy truffle fungus is greater with natural than with pelletized lime. Agroforesty Systems 72: 41-50. Growth, nutrient dynamics, and ectomycorrhizal development of container-grown Picea mariana seedlings in response to exponential nutrient loading. Canadian Journal of Forest Research 30: 191-201. Black truffle cultivation: a global reality. Forest Systems 23: 317-328. Influence of the fertilisation method in controlled ectomycorrhizal inoculation of two Mediterranean pines. Annals of Forest Science 64: 577-583. Experiments on the life cycle and factors affecting reproduction of Sphaerosporella brunnea provide evidence for rapid asexual propagation by conidiospores and for homothallism in an ectomycorrhizal competitor of cultivated truffle species. Fungal Ecology 8: 59-65. Growth versus storage: responses of Mediterranean oak seedlings to changes in nutrient and water availabilities. Annals of Forest Science 64: 201-210. Nitrogen-use efficiency: trade-offs between N productivity and mean residence time at organ, plant and population levels. Functional Ecology 18: 511-521. A test of a modified line intersect method of estimating root length. Journal of Ecology 63: 995-1001. A meta-analysis of mycorrhizal responses to nitrogen, phosphorus, and atmospheric CO2 in field studies. New Phytologist 164: 347-355. An exponential fertilization dose-response model to promote restoration of the Mediterranean oak Quercus ilex. New Forests 46: 795-812. Nursery cultivation regimes, plant functional attributes, and field performance relationships in the Mediterranean oak Quercus ilex L. Forest Ecology and Management 196: 257-266. Interactive effects of mycorrhization and fertilization on growth, nutrition, and water relations of sweet birch. Journal of Sustainable Forestry 17: 55-80. A new hypothesis to explain allocation of dry matter between mycorrhizal fungi and seedlings in relation to nutrient supply. Plant and Soil 168-169: 243-248.